I really love lightgun games (maybe a little too much), and I'm working on trying to get pretty much every type of console-compatible lightgun, as well as all the games that support them. About half a year ago, I finally picked up a SNES Super Scope. I'm sure some of you can sympathize, but a lot of the time when I buy games they end up going unplayed for months. I never even pulled my Super Scope out of the box until just last weekend! To put it simply, the thing is big, and it's pretty dang heavy, too. 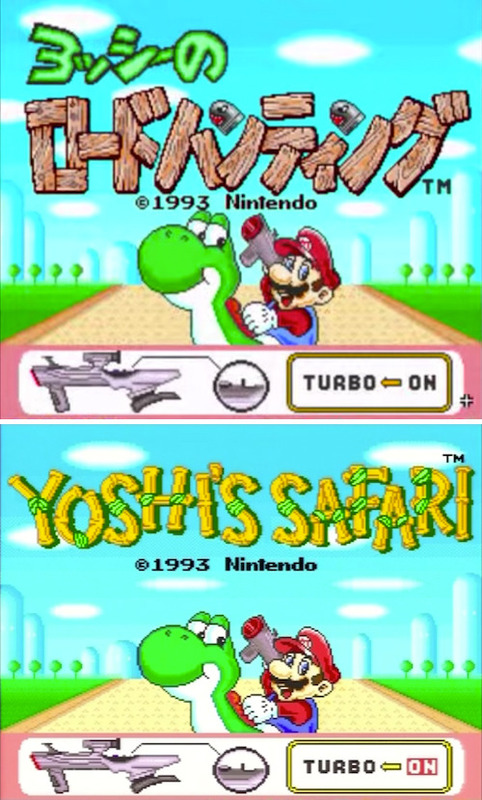 The first game I tried out with it was (the Japanese version of) Yoshi's Safari. 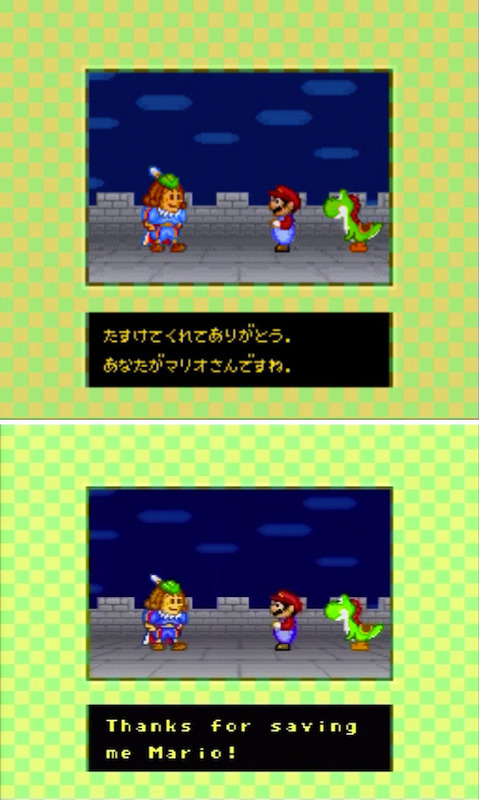 It's a fairly straightforward game, but this month let's take a look at some of the differences between Yoshi's Safari, and its Japanese counterpart ヨッシーのロードハンティング (yosshii no roodo hantingu, "Yoshi's Road Hunting")! Let's start off by talking a little bit about the Super Scope itself. 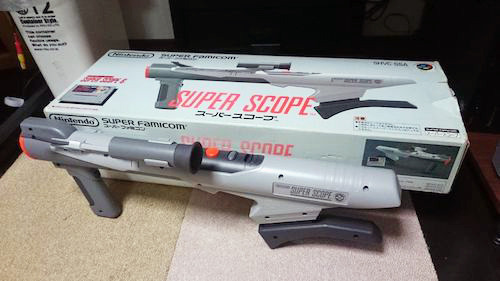 You might be surprised to learn that the Super Scope was actually released in the US first! It came out in both the North America and Europe regions in 1992, but didn't hit Japan until 1993 - and apparently didn't sell very well there, either. Indeed, there were 12 games for the Super NES that had Super Scope support, but Japan only ended up getting half of those. The thing is admittedly a little unwieldy to use, and presumably more so in the smaller rooms of Japanese houses. I know that was the case for me! Yoshi's Safari, however, came to Japan first: it was released here in July of 1993, with a US release two months later. Obviously it's a lightgun game, and you take the part of Mario riding on Yoshi's back. 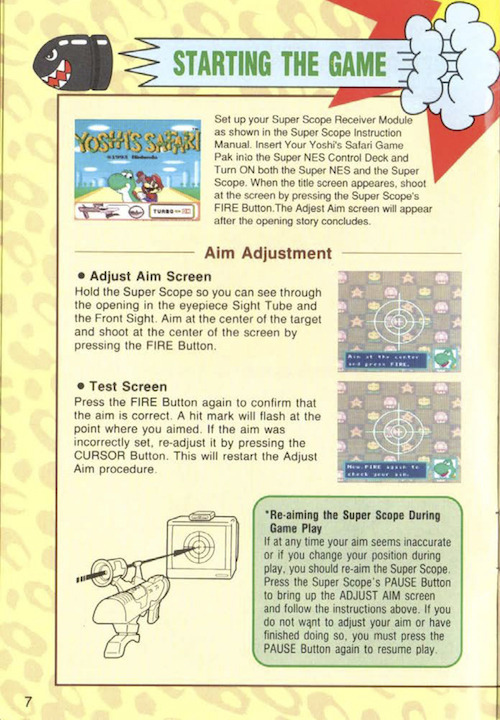 It's not 100% explicit, but the manual and in-game images seem to indicate that Mario's weapon is in fact the Super Scope itself! 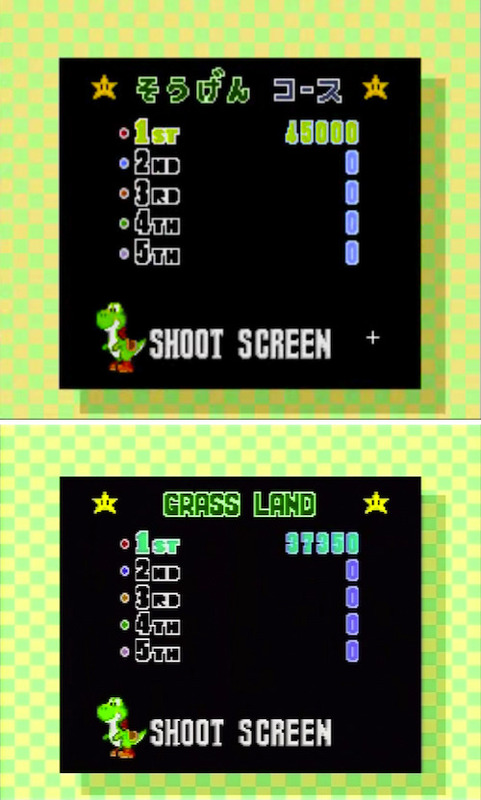 The Super Scope is required to play the game, but a second player can also join the fun by using a regular controller to perform all the non-shooting actions. There is, however, a bonus hard mode which can be unlocked by clearing the game once; it features a different color palette, harder bosses, and other small changes. The game's title is, of course, different in the US and Japan. "Road Hunting" isn't exactly improper English, but it's not a phrase you hear too often, either. "Safari", on the other hand, used to refer to a trip to go hunt wild animals, but modern safaris are just to see the animals, not hunt them, so it's a little bit strange of a title as well, really. The design of the titles are quite different as well. 「ロードハンティング」is made up of planks of wood; maybe they were going for a "signpost"-esque image? Regardless, the Bullet Bills in the ンs are a nice touch. "Yoshi's Safari" is made up of bamboo, but that's more of a jungle thing, and safaris generally happen in the savannah...eh, close enough, I guess? ピーチひめにたのまれた、マリオとヨッシーのふたりはさっそく、ジュエリーランドへとしゅっぱつしました。ピーチひめのはなしでは、ポットおうとパインおうじのふたりがゆくえふめいになり、さらにジュエリーランドのたからである、１２コのほうせきもきえてしまったということです。これはもしかすると、またまたクッパのしわざでは？ One day, Mario and Yoshi came to see Princess Peach... She told them of a nearby kingdom, a place called Jewelry Land. Princess Peach "You must go to Jewelry Land. Its rulers, Prince Pine and King Fret are in terrible danger. You must go there and save them. Please Mario, they are my friends!! Thank you! You must go at once. Good luck and take care, both of you!" As a favor for the princess, Mario and Yoshi begin on their journey. The princess told them King Fret and Prince Pine had been kidnapped. And, the treasure of Jewelry Land, 12 gems, had been plundered!!! Who could be responsible? Could it be that evil Koopa clan? As usual for these older games, the general gist is the same, but there are some interesting small differences. Prince Pine has the same name in Japanese, パイン王子 (pain ouji), but King Fett has a completely different name: ポット王 (potto ou, "King Pot"). "Fret" and "Pot" are completely unrelated words, so it seems like they kind of picked something at random. Then again, "Pot" and "Pine" don't have much to do with either jewelry or each other, so they're all rather frivolous names. As for why they didn't call him "King Pot" or "King Pott", the only thing I can think of is that they were worried about the marijuana connection. Nintendo certainly were strict about their family-friendly image in those days, so it wouldn't be too surprising if that were the reason. 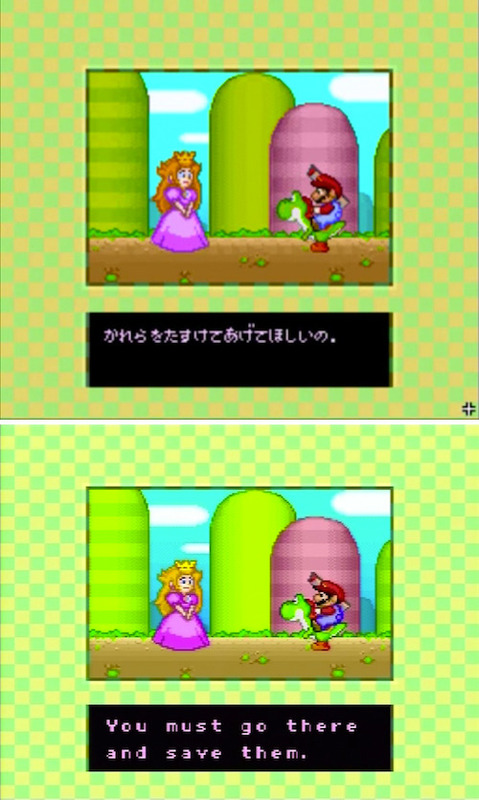 It's a tiny discrepancy, but the Japanese story says that Mario and Yoshi went to "hang out with" Princess Peach, rather than just "see" her. Also, it says that Prince Pine and King Fret "went missing" rather than that they were kidnapped, and similarly that the gems "disappeared", not "had been plundered". I suppose the Japanese version was trying to make things seem a little more mysterious, basically. She's always been called ピーチ姫 (piichi hime, "Princess Peach") in Japan. However, it was felt that "Peach" had too little to do with the "Mushroom Kingdom", and for the first few Mario games she was called "Princess Toadstool" in the US. 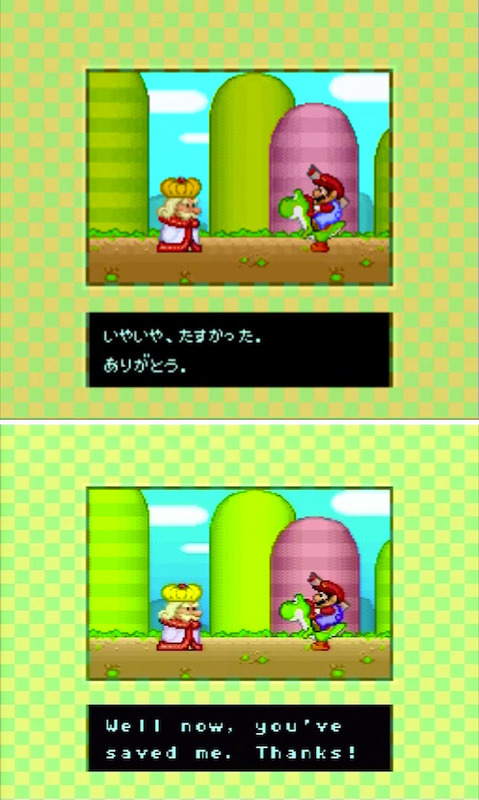 Eventually they clarified her name as "Peach Toadstool" and began referring to her as "Princess Peach" to match the Japanese version - and the first game to do so was Yoshi's Safari! These level names only show up at the end-of-level high score list, but they do exist! The Japanese level names are all named in the pattern of "[something] Course", and they're pretty generic, to be honest: "Grassy Course", "Mushroom Course", "Pipe Course", etc., you get the idea. The English names are a fair bit more creative, perhaps too much so in a couple places. One that really stuck out to me was "Spirit Mountain" - "spirit" usually has religious connotations (it's not referring to ghosts, there aren't any in the level), something which Nintendo was very quick to shy away from in those days, so it's a surprising choice. I have to admit that I didn't even know what a "cornice" was, but apparently it refers either ornamental moulding, or a shelf of snow overhanging the edge of a mountain. I uh, kinda feel like they could have come up with a slightly more suitable name - there's not even any snow in the level, it's actually full of fire enemies! This small interlude plays after you clear all of levels 1-7. ポット王「いやいや、たすかった。ありがとう。しかし、そのほうせきはあと５つのこっているのじゃ。それに、ワシのむすこのパインおうじもやつらにとらえられておる。おうじとほうせきは、やみのせかいじゃ。どうか、おうじをたすけだしほうせきを１２コあつめて、ふたたびこのくにをへいわにしてくだされ。おねがいしますぞ。」 King Fret "Well now, you've saved me. Thanks! But, they still have five gems, as well as my son, Prince Pine. Now go to the Dark Realm to get them. To return peace to this land, finish collecting the gems and save the prince. I'm counting on you." The King has a kind of "old-fashioned voice of kings of old" here, which can be difficult to express properly in English. You could do something like have him talk in a kind of "Shakespearean" manner, with a bunch of "thou"s and "whence"s, but it might just seem really strange, so normalizing his speaking style isn't that bad of an idea, really. ジュエリーランドのへいわをとりもどしたふたりは、ピーチひめのまつキノコワールドへかえっていきました。あのあと、クッパはどうしたかというと・・・・・コクッパとともに、じぶんたちのくにへかえったということです。こんかいのぼうけんは、これでおしまい。 Prince Pine "Thanks for saving me Mario! Princess Peach told me about you. You are such a brave man. Now, with the gems you collected, we can return peace to this land. Throw the gems above your head, and look up toward the sky. The secret power of the gems, will make the worlds one again." King Fret "Oh! Thank you for saving this world. I don't know how to thank you..."
Prince Pine "Thank you so much. The two worlds, have become one. Everything I have, I owe to you. Next time you come to visit, please bring Princess Peach." King Fret "Please be careful on your way home." After restoring peace to Jewelry Land, Mario and Yoshi returned to the Mushroom World. There Princess Peach awaits. But, what has become of Bowser? He has taken the Koopalings and returned to whence they came. This story is now over. Alright, we're going to get really nitpicky here, but there are some tiny differences to point out. In the Japanese, Prince Pine says something more along the lines of "Ah, you're Mario, aren't you? Princess Peach has mentioned you to me before." Just a slightly different nuance to their introduction. Also, he only tells Mario to "hold the gems to the sky", rather than to actually throw them, and it also doesn't refer to their power as "secret". "Everything I have, I owe to you." is a very strange translation - the original Japanese line is more just trying to say "Our land was saved, all thanks to you." Finally, the phrasing in the last section is a little strange: the "whence" does indeed feel really old-fashioned and out of place, and "This story is now over." is just ridiculously blunt. The Japanese there is a little more normal, it basically says "Well, that's where this adventure ends." Right off the bat, I can mention that the Japanese manual doesn't specifically say that Jewelry Land got its name from the 12 gems (though you can infer as much pretty easily). Also, similar to the in-game story, the Japanese doesn't come right out and say that Bowser kidnapped the king and prince, just that they were "imprisoned in the respective Realms". There's also no mention of an earthquake being the cause of the world splitting, it's rather implied that it was simply a direct result of the gems being stolen. For a really really tiny grammatical nitpick, in "Can they save the King and the Prince? ", "king" and "prince" should not be capitalized. Normally I wouldn't call out something like that, but on the previous page it's written correctly ("kidnapped both the king and the prince"), so I couldn't help myself. It's also interesting that they use very different backgrounds for this page - the Japanese one is the in-game level select screen, while the English one is just the cover artwork. Personally, I like the English version better, but what do you think? Now this is rare: "Adjest" is a straight-up typo in the manual for a Mario series Nintendo game! 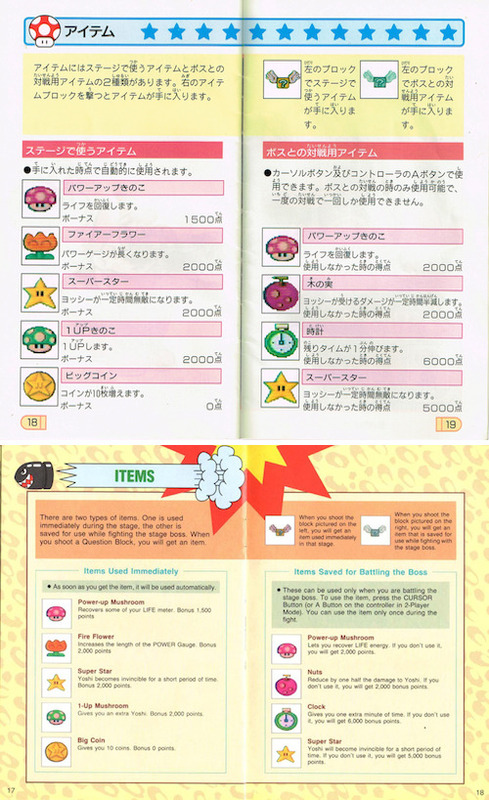 It was probably just an issue of lack of space, but the Japanese manual also has descriptions for Yoshi's life count and life gauge here. On the other hand, the Japanese version is missing the extra bit of explanation in the coin section about what happens if you miss a jump with less than three coins. 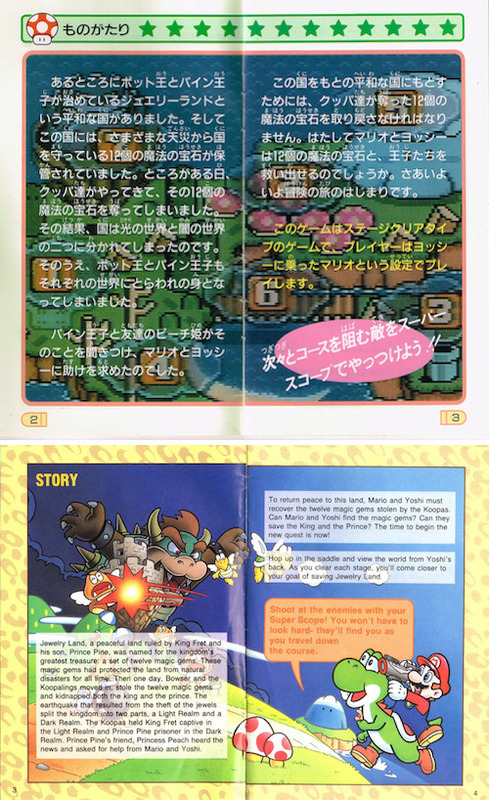 The Japanese manual has one extra sentence at the beginning of the lower section, which essentially says "Gameplay is very simple." I guess they felt like that might sound a little condescending to western players, or something? Also, it's interesting that the illustrations used are different. 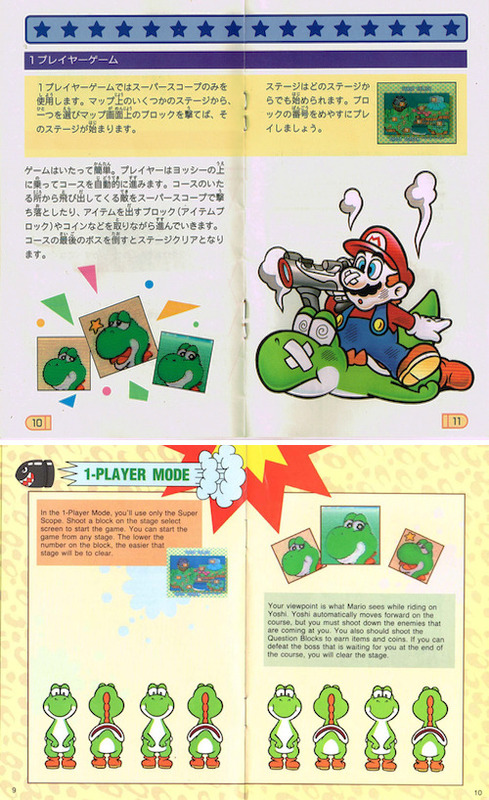 The picture in the Japanese manual of the blown-up Mario shows up later in the English manual, but these Yoshi drawings don't appear in the Japanese manual at all. The picture for the "Nuts" item isn't very...nutty, is it? The Japanese name, 「木の実」(ki no mi), can actually mean both "nut" and "berry"/"fruit", but I feel like the item image should've made it clear that in this case it's the latter, rather than the former. Also, this isn't an English/Japanese difference, but it's interesting to note that the "Power-Up Mushroom" item is not the same as the iconic Super Mushroom from the main series of Mario games, and it does indeed look rather different. 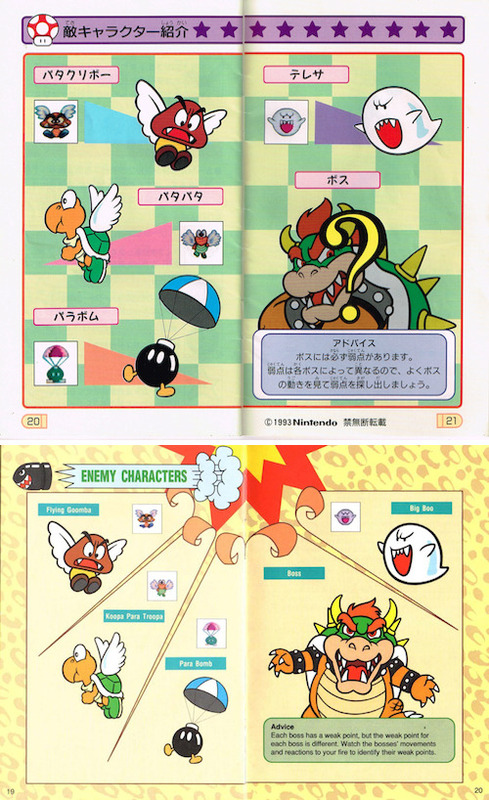 All of the other illustrations are the same, so it seems strange to me that Bowser gets a totally different picture in the English manual - and they've removed the "? ", too, almost making it seem like every boss is Bowser, or like Bowser is the only boss in the game. Also, the name "Paragoomba" had been used before this game and would continue to be used in other games after this one, so it's a mystery why they went with "Flying Goomba" here. Lastly, I just wanted to point out that the Bullet Bill explosion headers which are on most pages of the English manual are great, and this one actually blasting apart the background is an especially nice touch. The main visual is the same on both boxes, but for some reason Mario isn't present on the SNES box at all! My best guess is that, even though it is a shooting game, Nintendo was being very conscious of their family-friendly image like I mentioned earlier, and didn't want to show Mario with a giant gun on the cover of one of their games. This is just the ending theme to the game. There's nothing strange going on here at all, nope. I've been thinking about trying out doing a weekly gaming stream, mostly lightgun games to start. If you think you might be interested, give my Twitch channel a follow and maybe check it out when I start doing it! Either way, I'll be back here next month with a new article, so see you then!